Gazebos - Buy your Metal framed garden gazebo, awnings and canopies online. I would like to say a huge Thank you for such a wonderful service and customer service ! Our gazebo and swing chair are just perfect and amazing value for money ! We will certainly be back and will be highly recommending your company to our friends and family ! Thank you so muchxx What a wonderful company you are!!!! Our wonderful Gazebo is now in situ., Our neighbours have decided we must throw a party to welcome the new arrival (they are all as mad as a box of frogs - but nice ones). Many many thanks for a superior product and service. What a first class company you are . The Gazebo I ordered arrived in 2 days and is the envy of our neighbours plus a faulty part was sorted out with incredible speed, the correct one arriving within 24 hours of reporting the problem . The chiminea I purchased 18 months ago still looks as good as the day it was delivered which again is a top quality product. I shall sing your praises from the roof tops and wish you every success. Please use this testimonial for your website. To complete the overall look of your garden and create a real conversation piece for your friends and neighbours then a garden gazebo is a perfect choice. There are many gazebos and gazebo swings available with sizes to suit all gardens and budgets to suit all pockets. Fantastic quality, excellent value for money. Truly innovative in design and exclusive to our company, the Padbury garden party gazebo will clearly define your outdoor entertaining. Has a footprint measuring 2.57m x 2.57m and with the overhangs measures approximately 3m x 3m. *4 colour matched zipable mosquito nets included. Comes complete with Forged arrow heads in the side panels, pre drilled to allow fixing to concrete or decking for a secure feature to your garden. Replacement canopies usually stocked@ £68.90 each Call 01296 836836 to order. Comes complete with privacy curatins and nets, pre drilled soleplates to allow fixing to concrete or decking for a secure feature to your garden. Truly innovative in design and exclusive to our company, the Orlando luxury swing/bed Hammock will seat four/five in superior comfort. Truly innovative in design and exclusive to our company, the Addington luxury garden party gazebo will stand with grandure, clearly defining your outdoor entertaining. Deciding on which gazebo from the many that are on the market can be a difficult choice and one that you will naturally want to take time over. Fortunately there is a great deal of help and advice available when choosing the structure that is perfect for you and your garden. A lean to gazebo awning is the most simple of structures and the easiest to assemble. Placed against the side of your house with a canopy roof, this is both an attractive and practical design that will help you to enjoy your garden whatever the weather. You will generally find that a lean to gazebo awning is the most affordable way of introducing one of these attractive structures to your garden. From here, there is a great range of more elaborate gazebos that create a real cornerstone for your garden. Many shoppers look to buy an open gazebo which gives you ample room to place garden chairs and tables underneath and naturally there are many of these on the market. 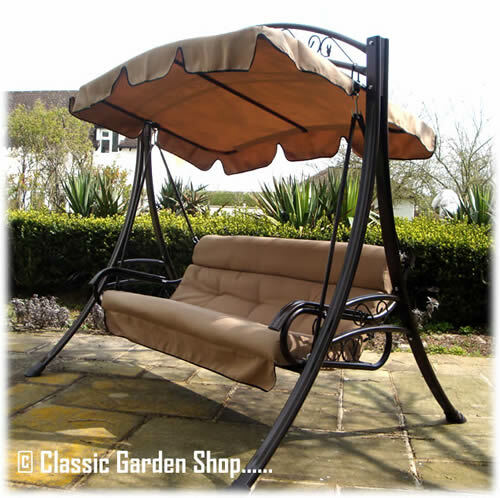 For real comfort, you may want to choose a garden gazebo that has a swing seat installed underneath. Perfect to relax, read a book, or snooze peacefully on those lazy summer days! For the traditionalists, the open gazebo is perfect for entertaining friends and family whether you`re enjoying a lazy barbecue or even an informal dinner party. Gazebo`s come in a range of styles and with luxurious fabric and elaborate metal designs, they can be tailored to suit any occasion. If you`re having a large party in your garden, a gazebo is an ideal focal point and a gazebo can even be constructed around a hot tub to provide that added touch of decadence. 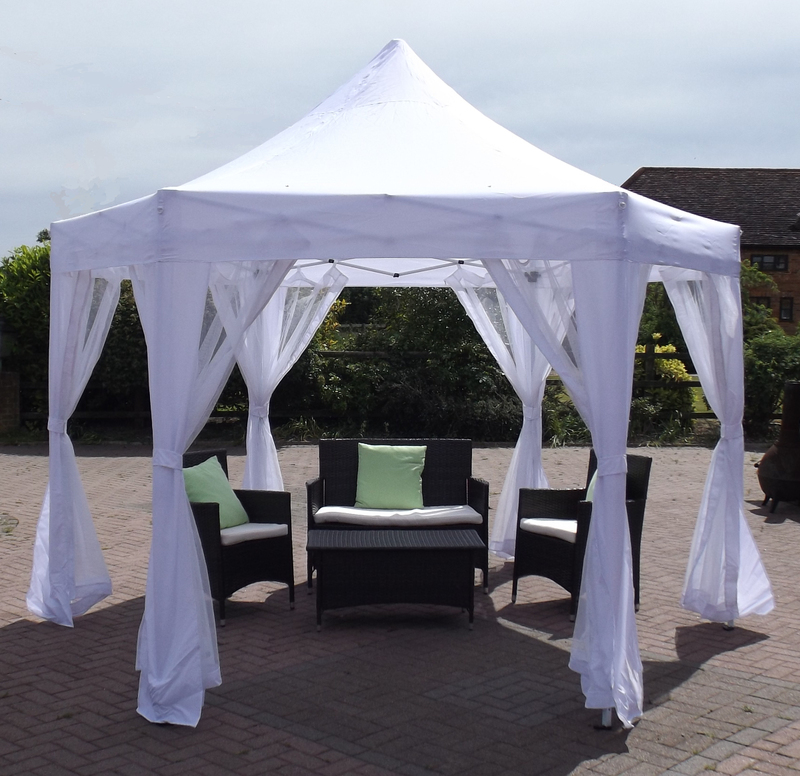 These open gazebos come in a range of styles and sizes to suit the occasion and also to complement the size of your garden. 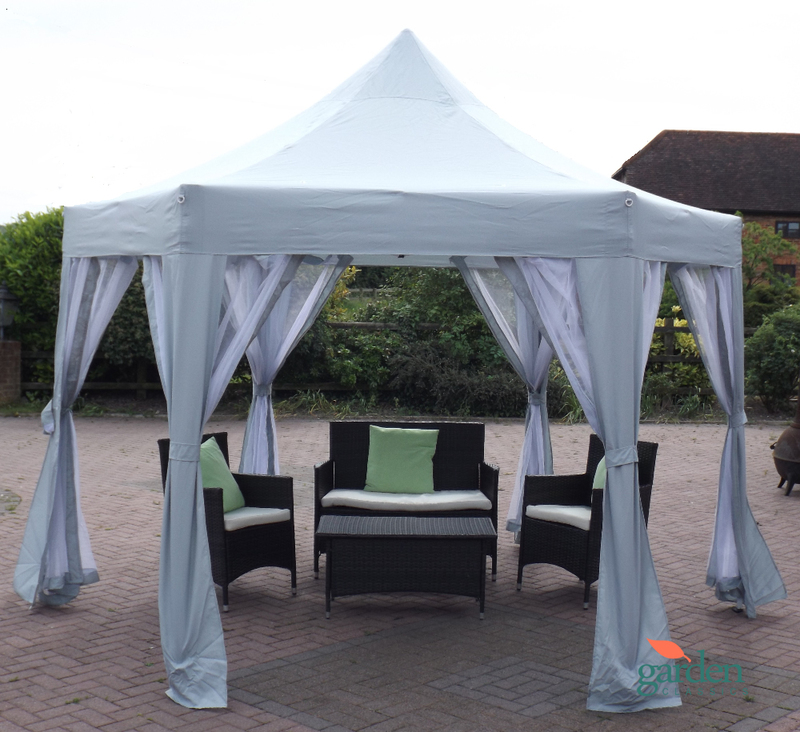 Gazebos can also be used purely as an ornamental item in your garden and for this you can choose a smaller size construction which will still give room for chairs but can also be decorated with climbing plants and have attractive flower beds at the bottom. Many people`s perception of gazebos is that they are merely a luxury item that is too expensive. This simply isn`t true and there is a range of gazebos available to suit all budgets. If you consider how much a conservatory will cost then a garden gazebo can provide the similar benefits to an extent, at a fraction of the price. If looked after correctly it will stay beautiful for many years to come. They can allow you to enjoy your garden most of the year round weather permitting and whether you want a centrepiece for entertaining, or a quiet corner in your garden where you can just sit and contemplate then there is a great selection on our site designed to suit all needs. Your Gazebo should give you years of service and enjoyment if you follow these instructions carefully and take care of your Gazebo correctly. Please read the instructions before attempting to erect your gazebo and save them for future reference. Check the contents of the boxes in advance of using your item for the first time. Ensure that you are familiar with the erecting of the Gazebo and that all parts are accounted for. You should familiarise yourself with the Gazebo including any restrictions it may have for your particular use. Our gazebos are not intended to be permanent structures and under most circumstances will provide shelter against the elements. There are however extremes of weather for which allowances should be made. The frames can be secured to the ground using suitable fixings for additional stability. Our pvc backed gazebo roof material is waterproof. However the seams of the canopies are stitched. It is therefore possible that a very small amount of leakage in these areas may occur in heavy rain. Find a level piece of ground on which to erect your Gazebo. Ensure that you have enough help to lift the Frame without straining yourself or the frame. We recommend a minimum of two or more persons are available to erect the structure for guidance and safety. 1. Follow the assembly diagrams in their sequential order. 3. When positioning your gazebo choose a level area avoiding trees and shrubs, barbecues, patio heaters and other heat sources. 4. Take care not to drag the canopy over the frame when attaching / removing to avoid snagging the material. IT IS IMPORTANT THAT YOU TAKE CARE IN WINDY WEATHER CONDITIONS. IT MAY BE NECESSARY TO TIE DOWN YOUR GAZEBO AT ANY STAGE DURING THE ASSEMBLY OR WHEN IN USE. Attention should be paid to the prevailing weather and we highly recommend at least canopies are removed at times necessary to avoid wind speeds in excess of 25mph. (at this level even umbrellas can become uncontrollable). Reverse of the assembly instructions. DRY ALL PARTS AT THE EARLIEST OPPORTUNITY. DO NOT PUT AWAY WET. During long periods of inactivity and during the winter months, it is essential that the canopy and curtains are stored in a warm dry environment. Failure to do this may result in mildew damage to these parts. Roof:Clean with a soft cloth or brush using mild Fenwick’s detergent solution and rinse. Air dry only. Curtains and mosquito nets: Machine washable in a 30 degree wash. Air dry, do not tumble dry. Frame: Brush off dirt and then wash with soapy water. Dry thoroughly. IMPORTANT: Damage through incorrect assembly, improper storage and adverse weather conditions are not covered by the manufacturer’s warranty.